Major Findings: # of User Posts on Instagram is ≈ 1 per day; profiles with more followers post with higher frequency; Instagram Interaction Rate is ≈ 4.8, Facebooks 0.7; Only 6.22 % of analyzed user posts are videos. Cologne 22nd April 2015 - The social media analytics provider quintly published an Instagram study of the average performance of Instagram profiles during the first quarter of 2015. Revealing actionable insights, the analysis is clustered in different sized groups to make it applicable for every social media marketer. Thus everybody is able to benchmark the own performance against the average and check whether the page is under- or over-performing. Digging deeper into the data of pages with more than 100k followers, quintly shares posting patterns from the most successful players in the market beside looking at the average. To make the study easy to interpret quintly chose the most important metrics, such as number of posts, interaction rates, video and photo distribution and discussed the outcome briefly. Through comparing the outcome with Facebook statistics, the reader of the study can draw conclusions on whether it is necessary to adjust activities or not. The social media analytics provider quintly gathered the data by analyzing over 5000 Instagram profiles. By increasing the amount of advertising shown in user timelines, Instagram has taken a significant step towards improving the relevancy of its network. This study is interesting for every social media marketer as interaction rates are considered to be significantly higher on Instagram than on Twitter or Facebook. Knowing this and how brands are able to improve their activities in this channel is the ultimate goal of the study provided by quintly. quintly is a professional social media analytics solution to track and compare the performance across Facebook, Twitter, YouTube, Google+, LinkedIn & Instagram. quintly is a web-based social media analytics tool that helps users track and benchmark their social media performance against their competitors, empowering clients to take better data-based decisions and optimize their social media strategy. quintly was founded in the small town of Ennepetal, Germany in early 2011 by the brothers Alexander and Frederik Peiniger and is now headquartered in Cologne, Germany since 2012. Having started off as a small team under the name “AllFacebook Stats” it was renamed later on to “quintly” as more and more networks have been integrated. quintly's clients can track Instagram, Facebook, Twitter, LinkedIn, YouTube and Pinterest. The company now employs 25 people in Germany, Brazil and the US, has users in 183 countries and serves paying clients in over 60 countries. After three years in business, quintly expanded internationally in 2014 and has established its US corporation as well as a sales office in Brazil with its headquarters remaining in Cologne. Besides providing an advanced analytics tool, quintly's international team also shares its expertise through publishing in-depth studies and social media data analyses regularly. To find more information about the story behind quintly, please visit https://www.quintly.com/about. In the UK Brand Report, quintly observed the Facebook performances of the 20 most valuable UK brands. The findings are helpful for marketers: ITV, Marks and Spencer and BBC are the three most active UK brands on Facebook, there is still a lot of potential of using social media for customer care. In quintly's most comprehensive Facebook report, 105 million posts of 94,000 profiles are analyzed. The learnings are helpful for Facebook marketers: videos receive more interactions than any other post types, weekends perform better than weekdays. 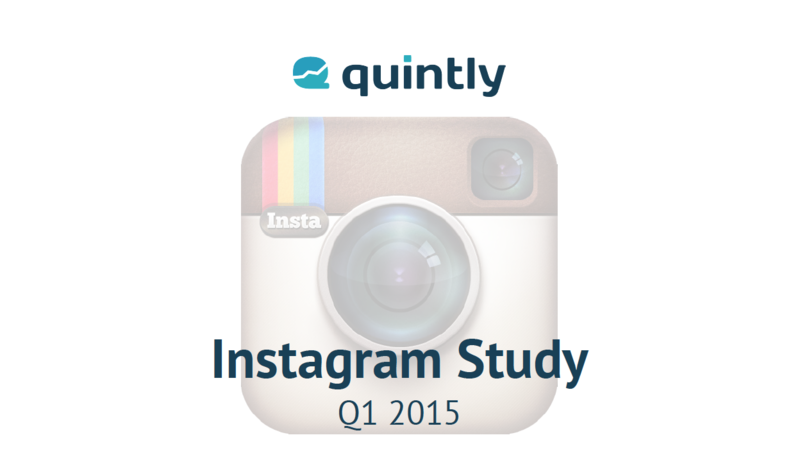 In quintly's most comprehensive report, 9 million Instagram posts are analyzed. The learnings are helpful for Instagram marketers. Videos outperform images, weekends perform better than weekdays. Study shows, Facebook Reactions are being used more - significantly more! Facebook new reactions usage have increased by 433% since April 2016 - This and more insights to be found in quintly's latest study. quintly reveals the best time to post analyzing 3.3 million posts.